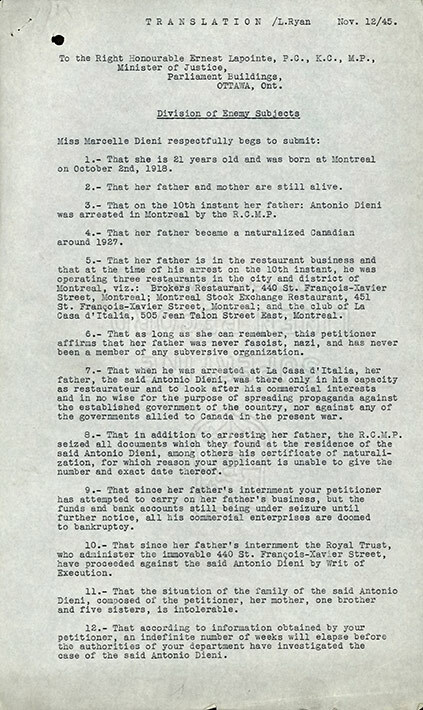 This two-page typewritten declaration by Marcelle Dieni, is identified as a translation and was submitted to Ernest Lapointe, Minister of Justice, on November 12, 1945. The declaration itself is dated five years earlier to June 19, 1940. Marcelle was the daughter of Italian-Canadian internee Antonio Dieni. At the time of the translation, Dieni would have been free for about 3 years. The reason for the translation is not known. However, at about this time, his attorney was advocating for restitution and compensation for the financial losses suffered as a result of Dieni's internment (see LDICEA2012.0017.0024). In the declaration, Marcelle identifies her father as the operator of three restaurants, one of which was located in the Casa d'Italia. She claims her father is a loyal citizen (a naturalized British subject). She denies he had any involvement with fascism -- the Casa was the location of the consulate for the Italian fascist government and the location of many related political and social activities. Furthermore, Antonio's brother, Gentile Dieni, who was also interned, was a loyal and unapologetic fascist supporter. Although Marcelle was attempting to carry on her father's business, she was unable to access the restaurants or assets, and "that all his commerical enterprises are doomed to bankruptcy". She asks for access to his assets and that his case be heard quickly, so if proved innocent, he may return to his business interests and save himself and his family from financial ruin.